The next Environmental Professionals Network (EPN) breakfast program will look at what’s new in your water. 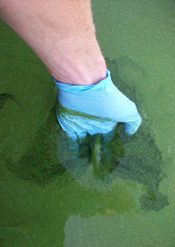 “Emerging Contaminants and Our Water Resources” is set for March 5 in Columbus. Many moons ago, as a wet-behind-the-ears grad student, I spent a winter living and working at CFAES’s Stone Laboratory at Put-in-Bay on Lake Erie. The winter was a good one for cold, snow, and ice, the lake freezing over in late December, the ice being broken up once by a storm, but then locking in and staying that way, solid, thick, and getting thicker, right into March. My roommate would drive his van on the lake, hauling his ice fishing gear. Guys from Canada’s Pelee Island would zip to Put-in-Bay by snowmobile, a distance of about 5 miles. Dozens of ice fishing shanties, a semi-permanent village, dotted a part of the lake where I’d seen a lone Lyman boat cruising just two months before, a mildish day in early December, the water black, eerily calm, but still then definitely liquid. If you’re an educator, and you’re interested in a hands-on way to teach your students about science and producing food, consider attending “Aquaponics in the Classroom: Teaching Real-World Skills Through Conservation,” a session at next month’s CFAES-sponsored Farm Science Review trade show. The session runs from 11-11:30 a.m. on the second day of the Review, Wednesday, Sept. 19, in the Gwynne Conservation Area. The session is free with paid admission to the Review. Ohio State is recognizing World Water Day with a Water Awareness event from noon to 3 p.m. this Thursday, March 22, in Great Hall Meeting Room #2 in the Ohio Union, 1739 N. High St. on the Columbus campus. Some 16 programs from Ohio State and the Columbus area will share displays on their efforts to protect water. Some of those programs are part of or have partners from CFAES. 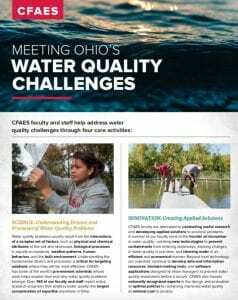 They include Ohio Sea Grant, the Wilma H. Schiermeier Olentangy River Wetland Research Park, the InFACT Discovery Theme, the Sustainable and Resilient Economy Program, the Global Water Institute, and the TerrAqua student organization. Admission is free and open to the public. Get details. Interested in taking classes at Stone Lab, Ohio State’s Lake Erie island campus, this summer? There are scholarships available to help you pay for it. Apply by March 1 if you’re in college, March 14 if you’re in high school. Learn more.